Saturday, Sept. 23, 1978: The big first date with Jocey. So many blurred memories, so many assumptions. But a detailed diary entry now holds a mirror up to it. According to the diary, I worked around the house during the day: cleaning the kitchen and mowing the grass. At 4:30 p.m. I called Jocey, told her when I’d be by, then showered and changed clothes, all the while listening to Al Stewart’s Time Passages on the stereo turntable. 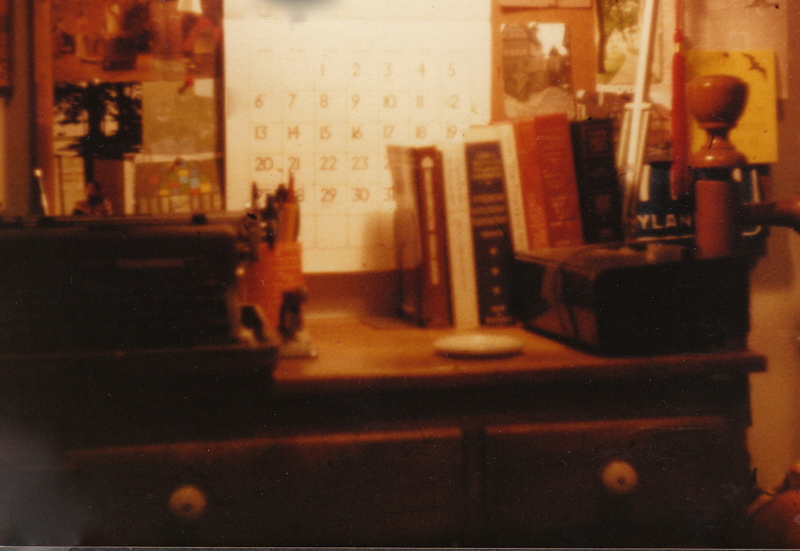 The photo top right was taken in ’78, of my bedroom writing desk, clock radio, Luxo lamp, reference books, Tolkien calendar and photos from Germany, Koronis and Shamineau. So, this was what I saw as I got ready that day. When I arrived at Jocey’s, “she looked absolutely fantastic.” I’d brought some writing and a photo album I’d titled “The Mirror and the Camera.” Then I met her mom and dad as they headed out to a movie with friends. We spent some time before the Dudley Riggs show talking and playing piano in their sunroom. Only standing room tickets were available at the Brave New Workshop. We bought them anyway and still enjoyed the show. Afterward we ate at Embers across the street: “She had a cherry shake, I had a salad and a cup of coffee.” We talked about my plans for writing The Crowded Room, “school, life, mythologies…” then took a walk around Lake of the Isles, stopping at a park bench where we “held each other close and talked in lyrics, and love…” before we got too cold, headed back to her house and said goodnight. light, always, in the darkness. And we did just that. But this university freshman had some other things to do first. “The College Student steps out on the Campus. My first day of classes at the U.” New kid in town, riding shotgun with his Dad to school. On the highway going into Minneapolis, new kid spots old camp girlfriend Debbie with her brother in the next car over. “…we avoided looking at each other. It was very embarrassing.” The only odd glitch in an otherwise remarkable day. After class, I hopped a bus downtown to meet Jocey at Bookfair in the IDS Center. She was with her friend Sara Nelson. We caught up, looked in at Musicland, then the girls went shopping. I caught a bus back home, arriving late for my night shift. While Mom and Dad took a long weekend vacation up north with friends, I’d secretly plotted to use money saved up for school to buy a car. 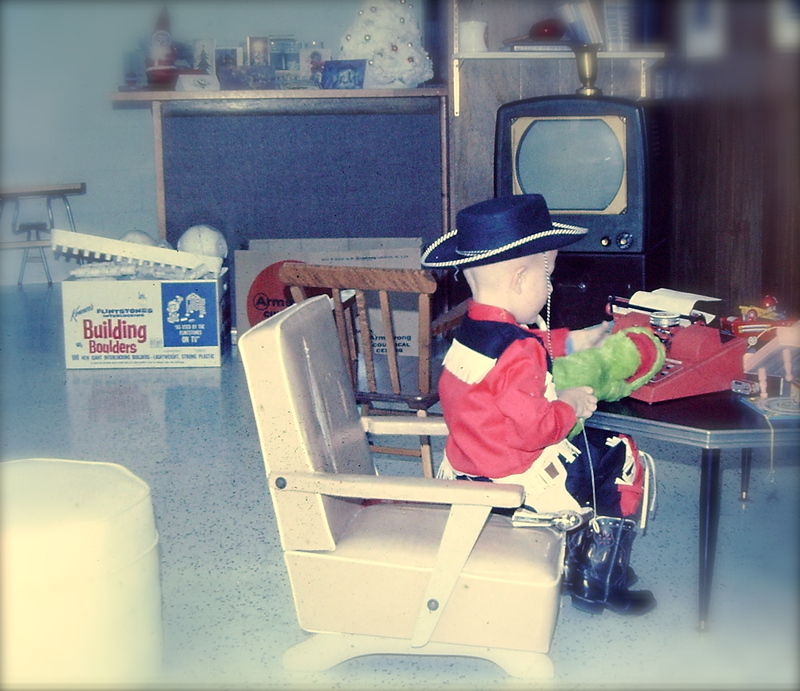 All my other friends had their own vehicles, and I’d had it with borrowing Mom’s car. So, on Sept. 29, 1978, I drove to school and after classes bought a used ’71 Datsun 1200 at Metro Mazda on University Avenue. It was a total rattletrap. The floorboards were rusted through. Pot seeds were scattered on the floor mats. It was a beautiful wreck—and it was all mine. It’d be a couple days before I could take delivery, so that bought time to break the news to the ’rents when they returned on Sunday, Oct. 1. The previous day I was over at Jocey’s, helping her Dad put together a ping pong table in their basement. Jocey and I later hung out in her sister Leslie’s room, looking at photos and listening to records I’d brought. When Jocey walked me to Mom’s car, she seemed nervous and said she needed to confess something. The day we’d met she’d told me she was a high school junior. There and then she admitted she was actually a sophomore. My face must’ve betrayed me—it was something of a gut-blow. Then, on Tuesday, Oct. 3, 1978, I stopped writing in the diary altogether. ~ by completelyinthedark on August 2, 2013. This brought a smile to my face. I loved to write in my journal, now that I discovered blogging, I stopped (I don’t have a lot to write about). My memories are often hazy too until I reach for one of my journals and I remember exactly what I was doing and feeling that moment in time. I agree. Handwriting can be too slow!